Hayarpi (21), Warduhi (19 ) and Seyran (15) Tamrazyan: are finally free. A church service that has run continuously for nearly 100 days in The Hague has finally ended after a political agreement was reached that offers the Armenian family being sheltered there a safe future in the Netherlands. The Dutch government agreed to pardon the Tamrazyan family who had been threatened with deportation as part of a wider amnesty that will affect more than 600 families. Under pressure from campaigners the government announced it would examine the cases of 700 children and their families who are under the threat of deportation. Residency rights were likely to be granted in 630 of the cases, according to government officials. Derk Stegeman, a pastor at Bethel church, said the Tamrazyan family had been reassured that they would be included among those allowed to stay in the country. 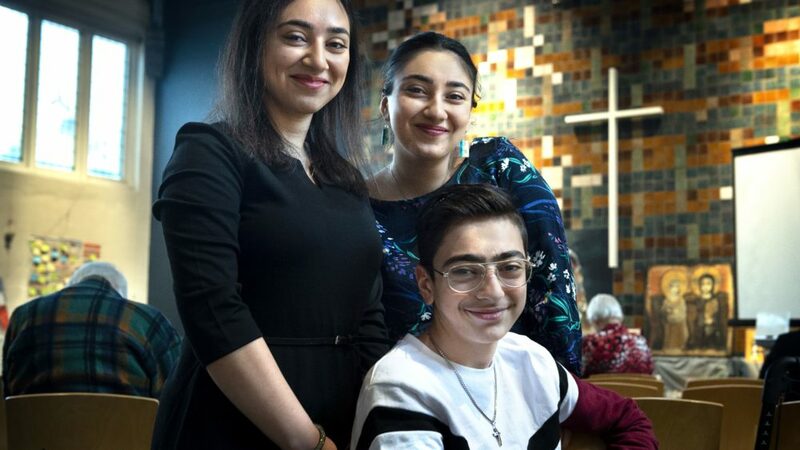 Sasun Tamrazyan, his wife Anousche and their children Hayarpi, 21, Warduhi, 19, and Seyran, 15, had lived on the grounds of Bethel church for three months, relying for protection on an old law that says immigration authorities cannot enter while a religious service is being performed. The service wrapped up in a packed sanctuary, with speeches from eldest daughter Hayarpi and Rev Theo Hettema, a spokesperson for the Protestant Church of The Hague’s asylum efforts. We are extremely grateful for a safe future for hundreds of refugee families in the Netherlands. For months we have held up hope and now that hope is taking shape. We are deeply impressed by all the predecessors, volunteers and others who have participated in this church shelter,” Hettema said. The Tamrazyans fled their native Armenia nine years ago after Sasun’s political activism earned him death threats. They sought asylum in The Netherlands, where a judge granted the family asylum but the government succeeded in having the ruling overturned. Further applications to the government for asylum were refused, and they received a deportation order. The amnesty was the result of an intense debate within the Dutch government over the future of a dispensation available to families with children who have lived in The Netherlands for more than five years. As part of the agreement, this so-called “children’s pardon” will be taken off the statute books, but the head of the Immigration and Naturalisation Service will have discretionary authority in such cases rather than a politician. While welcoming the end of a long period of uncertainty for many families, the Protestant Church in the Netherlands expressed concern about a Dutch government announcement that in future only 500 rather than 750 people a year would be taken from refugee camps run by the UN in war zones. “The Protestant Church will always continue to fight for a humane reception of refugees,” said Hettema, chair of the General Council of the Protestant Church in The Hague. Pray for Sasun and Anousche Tamrazyan, and their children Hayarpi, 21, Warduhi, 19, and Seyran, 15. Pray for Christian leaders who advocate for refugees to Governments around the world. Pray for your local church and other churches to be alive to the challenge of helping refugees.